If your dog developed weakness and loss of muscle mass in his back legs, you may be wondering “are there any exercises that can help strengthen my dog’s hind legs?” The question is a very good one considering that in people there are many options for rehabilitation and exercises to strengthen arms and legs. So today we asked veterinarian Dr. Ivana Vukasinovic if there are any exercises that may turn helpful to dogs who could benefit from some strengthening in their back legs. Paraparesis is a non-specific term for bilateral motor dysfunction of the pelvic limbs. It presents itself as hind legs weakness, and some of the symptoms are: more frequent need for sitting, dragging feet on the ground, characteristic “bunny hopping” method of movement while running, which occurs because the dog feels more stable when both feet are on the ground. Causes for paraparesis can be divided into vascular, inflammatory-infectious and trauma and metabolic causes such as idiopathic (of unknown cause), tumors and degenerative (progressive, often irreversible deterioration). Older and obese dogs are more susceptible to these problems. Just like in humans, the most common exercises are the ones hitting big hind legs muscles, such as squats. When your dog is sitting, make him get up and move forward as the one-motion movement, like going after some ball or snack. 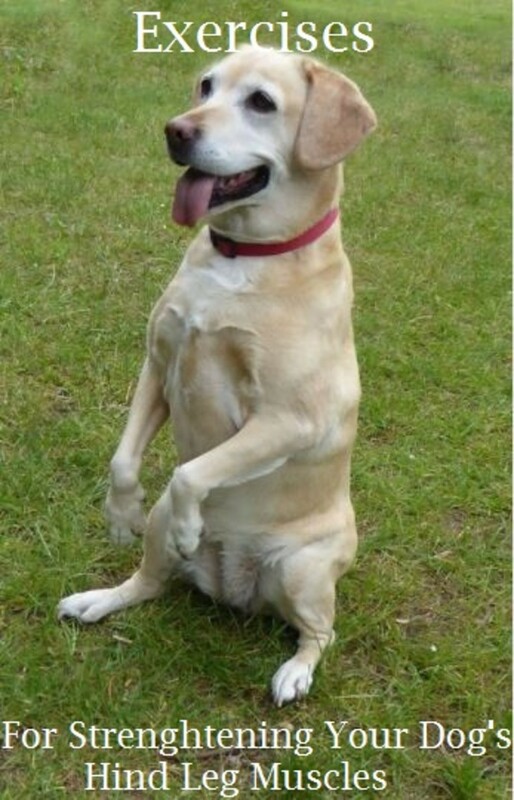 Dogs tend to mainly distribute their weight on their front feet, so it is necessary to strengthen the hind legs. One of the good ways is to put your dog on some higher ground, like a chair, while hind legs are still on the floor, so the lower body would carry all the weight. Your dog should maintain this position for 30 seconds or more, with a few reps in a series. There is the undeniable benefit of swimming for all animals with locomotor system problems. Even in your bathtub, warm bath with gentle massage can help your dog by increasing the blood flow and lymph drainage. On the other hand, hand massage of problematic regions can help as well, to decrease the existing pain, and to help the whole system. Body strength exercises, specific range-of-motion exercises, just like in humans, can help your aging dog, and these exercises include slowly flexing and extending of joints, or practicing balance.